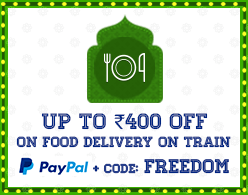 Apply Coupon: FIRSTBITE on checkout & Get flat Rs.100 Off on your order! Shettys Parcel Kitchen located near Kalyan Junction is the most preferred choice of RailYatris' to order food in train. Order now from Shettys Parcel Kitchen & have a yummy journey! You can order this roti spread with enough butter to make it soft. This comes with ample helping of seasonal veg (150 gms). Make your tummy happy with tasty paneer butter masala (150 gms) that comes with 3 soft butter roti. What a delight on your journey! Enjoy a mouth-watering twist with this Shahi Paneer (150 gms) prepared in thick gravy made up of cream, tomatoes and spices from the Indian subcontinent served well along with rice. Make your journey simply tasty. The best way to get the flavour of Chinese food is with our combo. Enjoy the deliciousness of veg manchurian with rice. The dishes are made with clean and healthy ingredient. The best way to get the flavour of Chinese food is with our combo. Enjoy the deliciousness of chilli paneer with rice. The dishes are made with clean and healthy ingredient. The best way to get the flavour of Chinese food is with our combo. Enjoy the deliciousness of chicken manchurian with rice. The dishes are made with clean and healthy ingredient. The best way to get the flavour of Chinese food is with our combo. Enjoy the deliciousness of chilli chicken with rice. The dishes are made with clean and healthy ingredient. The best way to get the flavour of Chinese food is with our combo. Enjoy the deliciousness of veg manchurian with noodles. The dishes are made with clean and healthy ingredient. The best way to get the flavour of Chinese food is with our combo. Enjoy the deliciousness of chilli paneer with noodles. The dishes are made with clean and healthy ingredient. The best way to get the flavour of Chinese food is with our combo. Enjoy the deliciousness of chicken manchurian with noodles. The dishes are made with clean and healthy ingredient. The best way to get the flavour of Chinese food is with our combo. Enjoy the deliciousness of chilli chicken with noodles. The dishes are made with clean and healthy ingredient. Enjoy a scrumptious assortment paneer veg (100g), seasonal veg (100g), dal (100g), jeera rice (150g), 3 roti with salad & pickle. The dishes are made with clean and healthy ingredients. This yummy veg biryani is made with unique and subtle use of spices combined with ghee taste. Cooked with mix and fresh seasonal veggies. A simple version that is way too good and will appear regularly on your menu. It is a perfect balance of veggies, rice and spices. Served with raita. This yummy chicken biryani has a unique, subtle use of spices combined with ghee taste. Served with raita. Egg Biryani is cooked with basmati rice flavoured with exotic spices which add more aroma to it. Served with Raita. This yummy biryani has different taste cooked with mix and fresh seasonal veg. Nicely cooked for a veggies lovers and served with raita. Enjoy a mouth-watering twist with this soft paneer butter masala (150g) that goes well along with butter rotis (3). Make your journey simply tasty. This mouth-watering Paneer Masala of marinated paneer cheese served in spiced gravy. Grab it now. Paneer Bhurji, a delightfully spicy scrambled paneer dish that can be served as an accompaniment or side dish. Simply irresistible. Delicious Paneer Kolhapuri is admired for its spicy and a very aromatic flavourful dish. This dish has soft chunks of paneer with fresh ground masala that goes well with rice, roti, naan or paratha. Mushroom Masala is cooked in a rich, creamy masala with mushroom chunks. This dish will add a zing to your taste buds. Order right away and enjoy! Nothing can beat the flavours of these yummy Aloo Paratha (2 pcs) stuffed with spiced aloo which is served with fresh curd. Enjoy! Nothing can beat the flavours of these yummy Pyaz Paratha (2 pcs) stuffed with spicy onion which is served with fresh curd. Enjoy! Nothing can beat the flavours of these yummy Paneer Paratha (2 pcs) stuffed with spicy paneer which is served with fresh curd. Enjoy! Fresh and thick curd (200 gms) to enjoy with your meal. Get yourself a bowl full of Green Salad to keep the healthiness intact. Get yourself a bowl full of Onion Salad to keep the healthiness intact. Crisp boondi mixed in a perfectly spiced thick curd is a heavenly delight in every spoon. A perfect dish to add on to any meal. Tempting Cucumber Raita made of chopped cucumber which are mixed with chilled healthy curd. A perfect dish to add on to any meal. Tempting Mix Veg Raita made of chopped veggies which are mixed with chilled healthy curd. A perfect dish to add on to any meal. Fine-grained rice cooked and served as Plain Rice (300 gms) works as a perfect dish to relish with any gravy or dry vegetable. Simple in taste and light on belly. Order it now! This is an all time favourite meal. Jeera Rice (300 gms) is cooked by tempering rice with jeera and dollops of ghee. You can have it with any nice side dish. We bet you wont be able to resist from the flavours of this scrumptious Veg Pulao (300 gms). Steamed rice cooked with rich vegetables and flavours. A perfect treat for taste buds. We bet you wont be able to resist from the flavours of this scrumptious Paneer Pulao (300 gms). Steamed rice cooked with soft paneer and flavours. A perfect treat for taste buds. This yummy Veg Biryani (300 gms) has a unique, subtle use of spices combined with ghee taste cooked with mix and fresh seasonal veg. Nicely cooked for a veggies lovers and served with raita. The traditional aromatic Chicken Biryani (400 gms) has authentic taste cooked with masaledar juicy chicken seasoned in exotic spices which add more aroma to it. Egg Biryani is cooked with rice flavoured with exotic spices which add more aroma to it. Be ready to enjoy this Veg Fried Rice (300 gms) made with fresh and hand-picked vegetables complemented with tangy tomato sauce. Happiness comes in simple dish too! Be ready to enjoy this Veg Chilli Garlic Rice (300 gms) made with fresh and hand-picked vegetables with full of chilli and garlic flovours. Happiness comes in simple dish too! Happiness comes in mini size too. Grab on this mini thali comes with seasonal veg / mix veg (100g), dal (100g), plain rice (150g), roti (3 no), salad & pickle. The dishes are made with clean and healthy ingredient. Be ready to enjoy this Veg Schezwan Rice (300 gms) made with fresh and hand-picked vegetables with full flavours of schezwan. Happiness comes in simple dish too! Be ready to taste an amazing assortment of paneer veg (100g), seasonal/mix veg (100g), dal (100g), jeera rice (150g), roti (3 no), sweet (1 no), salad & pickle. The dishes are made with clean and healthy ingredients. Be ready to enjoy this Chicken Fried Rice (300 gms) made with fresh and tender shredded chicken complemented with tangy tomato sauce. A must have! Enjoy a scrumptious assortment of 2 pcs chicken with gravy, seasonal veg, dal, jeera rice, roti (3p), sweet, salad & pickle. The dishes are made with clean and healthy ingredients. Be ready to enjoy this Chicken Chilli Garlic Rice (300 gms) made with fresh and hand-picked vegetables and tender shredded chicken with full of chilli and garlic flavours. Happiness comes in simple dish too! Be ready to enjoy this Chicken Schezwan Rice (300 gms) made with fresh and hand-picked vegetables and tender shredded chicken with full flavours of schezwan. Happiness comes in simple dish too! The words chow mein mean stir-fried noodles, chow meaning stir-fried and mein meaning noodles. The noodles are stir-fried with cabbage, carrots, beans, green onions, ginger and garlic for a flavourful vegetarian dish. NOTE – We use the seasonal vegetables. Mouthwatering Veg Hakka Noodles (300 gms) are boiled noodles stir fried with Veggies and sauces to bring to you yummy Indian style Chinese. Be ready to enjoy this Veg Chilli Garlic Noodles (300 gms) made with fresh and hand-picked vegetables with full of chilli and garlic flavours. Happiness comes in simple dish too! Be ready to enjoy this Veg Schezwan Noodles (300 gms) made with fresh and hand-picked vegetables with full flavours of schezwan. Happiness comes in simple dish too! Chicken Chowmein (300 gms) is healthy and added with lot of vegetables like carrots , french beans, cabbage & pieces of chicken with egg to make it more healthier with the stir fry noodles and sauce. Mouthwatering Chicken Hakka Noodles are boiled noodles stir fried with sauces and chunks of chicken makes this an authentic Chinese dish. Order now. Be ready to enjoy this Chicken Chilli Garlic Noodles (300 gms) made with fresh and hand-picked vegetables and tender shredded chicken with full of chilli and garlic flavours. Happiness comes in simple dish too! Be ready to enjoy this Chicken Schezwan Noodles (300 gms) made with fresh and hand-picked vegetables and tender shredded chicken with full flavours of schezwan. Happiness comes in simple dish too! Soft and fresh tandoori roti cooked in a tandoor. Add this to your meal and get a different taste to your meal. Soft and fresh tandoori roti with just the right amount of butter cooked in a tandoor. Add this to your meal and get a different taste to your meal. Smeared and tossed with butter, this Naan gives you a unique softness in every bite. Eat it well with any any gravy or dry vegetable of your choice. A crisp Punjabi delight Kulcha stuffed with paneer baked in Indian tandoor that gives you a unique softness in every bite. Dal Fry (250 gm) is one of the popular healthy recipe with full of protein. Basically it is medium to thick. A popular Indian dal or lentil recipe. The delicious Tadkedaar Dal (250 gms) sauted with whole cumin seeds have a slightly nutty flavor. A perfect side dish to have on your train ride. Aloo Matar (250 gms) is cooked in a rich, creamy masala with aloo and matar chunks. This dish will add a zing to your taste buds. Order right away and enjoy! The delicious Aloo Jeera (250 gms) sauted with whole cumin seeds have a slightly nutty flavor. A perfect side dish to have on your train ride. Aloo Masala (250 gms) is cooked in a rich, creamy masala with aloo chunks. This dish will add a zing to your tastebuds. Order right away and enjoy! Enjoy ghar ka swad in Seasonal Veg (250 gms) with fresh and handpicked vegetable as per season cooked along with spices. A perfect side dish to have on your train ride. Paneer Butter Masala (250 gms) cooked in a rich, creamy masala with paneer chunks. This dish will add a zing to your taste buds. Order right away and enjoy! Enjoy a mouth-watering twist with this Kadhai Paneer (250 gms) cooked in thick zingy gravy retaining the aroma of varied spices. Make your journey simply tasty. Enjoy ghar ka swad in Mix Veg (250 gms) with fresh and handpicked vegetables cooked along with spices. A perfect side dish to have on your train ride. Matar Paneer (250 gms) is cooked in a rich, creamy masala with paneer and matar chunks. This dish will add a zing to your taste buds. Order right away and enjoy! This mouth-watering dish of Shahi Paneer (250 gms) is a delightful treat for your taste buds. Get ready to indulge. This mouth-watering Kaju Paneer (250 gms) is rich, creamy and delicious cooked in thick zingy gravy retaining the aroma of varied spices. Make your journey simply tasty. Malai Kofta (250 gms) is prepared with delicious melt in the mouth kofta (1 pc) in a creamy, rich, mild and lightly sweet gravy which have a distinct aroma. A perfect treat for taste buds. Paneer Do Pyaza (250 gms) is cooked in a rich, creamy masala with paneer and onion chunks. This dish will add a zing to your tastebuds. Order right away and enjoy! Veg Manchurian Gravy are deep fried veg balls dipped in spicy and creamy manchurian gravy. Add to your dish and enjoy your journey. Paneer Chilly (300 gms) is marinated cubes of paneer fried in thick gravy of garlic and chilli makes a must add to the menu. Delicious Palak Paneer (300 gms) prepared in a yummy curry by cooking shallow fried paneer cubes in a healthy spinach gravy will add a zing to your taste buds. Order right away and enjoy! Mushroom Masala (300 gms) is cooked in a rich, creamy masala with mushroom chunks. This dish will add a zing to your tastebuds. Order right away and enjoy! Mutter Mushroom (300 gms) is cooked in a rich, creamy masala with mushroom and matar chunks. This dish will add a zing to your taste buds. Order right away and enjoy! Veg Kofta (300 gms) prepared in rich curry which have a distinct aroma and taste of ground and whole spices with kofta made out of minced veggies and spices. Make your journey simply tasty. This mouth-watering Egg Curry (2 pcs) is a delightful treat for your taste buds. Get ready to indulge healthy eggs cooked with masala and gravy. This mouth-watering Chicken Curry (3 pcs) is a delightful treat for your taste buds. Get ready to indulge juicy tendered chicken cooked with masala and gravy. Enjoy a heavenly treat of creamy Butter Chicken (2 pcs). Order this flavorsome dish and give a mouth-watering twist to your journey! Chicken Do Pyaza is cooked in rich spices and onion. This popular Punjabi dish can be had with roti or naan. Rich gravy makes it all the more tasty. This mouth-watering and juicy Kadhai Chicken is a delightful treat for your taste buds. Get ready to indulge. Chicken Manchurian are deep fried chicken balls dipped in spicy and creamy manchurian gravy. Add to your dish and enjoy your journey. Chicken Chilli (8 pcs) is all time favourite chicken dish made with capsicum and other rich spices. A perfect side dish to have on your train ride. Also known as Thayir Saadam, this South Indian Curd Rice is a meal enough to tantalize yours taste buds. The traditional aromatic Dum Veg Biryani has authentic taste cooked with ghee, mix and fresh seasonal veg and exotic spices which add more aroma to it. A must have. The traditional aromatic Chicken Dum Biryani has authentic taste cooked with masaledar juicy chicken seasoned in exotic spices which add more aroma to it. Soft and fresh Plain Chapati to enjoy with your meal. This is a mouth-watering sweet. Gulab jamun (2 pc) is a delightful treat for your taste buds. Get ready to indulge. Soft and fresh roti with just the right amount of butter. Happiness comes in Mini Size too. Grab on this thali which comes with seasonal veg (100g), dal (100g), plain rice (150g), 2 roti with salad & pickle. The dishes are made with clean and healthy ingredients.